BROOKLYN, NY — Being a native of West Orange, New Jersey, Cleveland Cavaliers guard Kyrie Irving grew up watching Jason Kidd take the then-New Jersey Nets to back to back NBA Finals in 2002 and 2003. “Not many people have that niche and that feel for the game, and watching him play was a pleasure,” he said. When the Nets named the recent Knick point guard as their new head coach this month, Irving liked the move. “He’s a tremendous leader, obviously Brooklyn sees something in him from a leadership standpoint,” Irving said at his Kyrie Basketball Procamp this past weekend at Montclair State University. Although Kidd has never had any formal coaching experience, Irving feels that Kidd’s experience as a floor general validates his experience. “He’s coming off the court, but I feel like his last few years he was actually a coach on the floor,” Irving said. 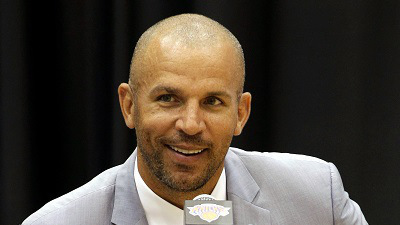 Kidd, like Golden State Warriors coach Mark Jackson, have helped extend the trend of recent coaches getting jobs after no coaching experience, Irving notices the trend. “(Kidd)’s not the first player to become a coach but he’s setting the trend for guys that are just now retiring,” he said. “Not a lot of people are retiring and all of a sudden become a head coach. That’s something that’s unheard of but he’s setting a trend for us, the players,” he said. Averaging 22 points this season and 5 assists this past season, Irving will be playing for a new coach himself with Mike Brown returning to Cleveland. Irving is optimistic that he and his new coach will work well. “I’ve gotten a chance to go back to Cleveland. I talk to Mike Brown almost every week and see how we’re doing and we just have to build a relationship,” said Irving. ← 2013 Stanley Cup Finals, Game 6: VICTORY!! !